The funding came from the Tennis in the Parks program, which dispersed $1,300,000 last year and will deliver another $2,000,000 in the next two years to public parks. The renovation was done in the fall by Danny Dobbs Tennis Co. of Austin, Texas. The New Mexico State Legislature had issued a grant of $40,000 during their last session for the project, while the Carlsbad High School Tennis Booster Club added another $1,000. The city picked up the remaining $51,000 to revitalize the community complex's nine asphalt courts. Local players have pitched in with additional funds to replace the windscreens, and they have done some minor repair work around the site. 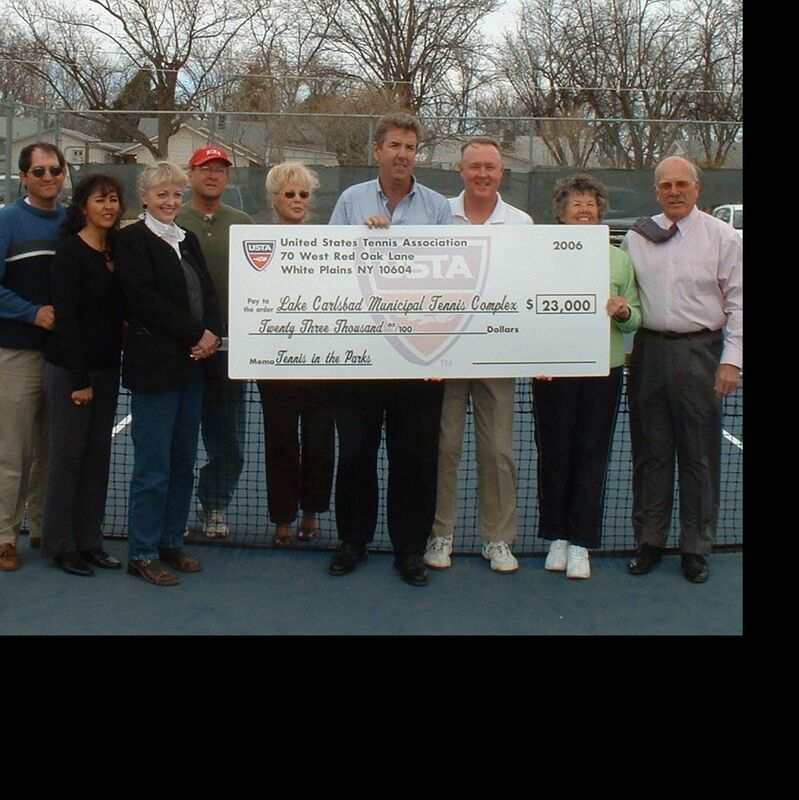 The check was delivered to Mayor Bob Forrest by John Austin, Executive Director of the USTA Southwest Section, from Phoenix, Arizona. In attendance were Donnie and Pat Rodriguez, Tennis Booster Club officers; Lorraine Allen, Carlsbad Tomorrow Director; Dale Melbourne and Vicki Griffith, tournament players; Charlie Jurva, City Tennis Pro; Faye Stokes, Vice President of USTA Southeastern New Mexico, from Roswell;	Bill Lucero, USTA Southwest Section Community Tennis Coordinator; Bob Forrest; and John Austin.